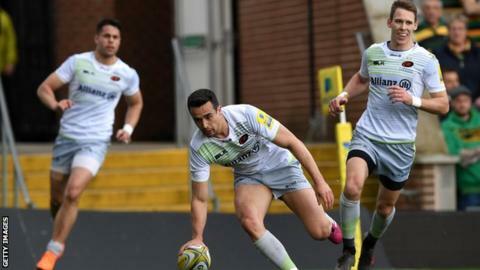 Saracens scored 48 unanswered second-half points to thrash Northampton and go three points behind leaders Exeter. The first half was even, with Reece Marshall scoring on his Premiership debut in between Sarries tries by Alex Lozowski and Schalk Brits. But the visitors ran riot after the break, with scores from Ben Spencer and Mako Vunipola sealing the bonus point. Liam Williams, Chris Wyles, Sean Maitland, Jackson Wray and Nathan Earle all went over in the last 22 minutes. Saracens are second in the table with three regular-season games remaining as they look to secure a home play-off semi-final, while Northampton are down in 10th. The sides have met on four occasions this season, including two Champions Cup meetings, with Mark McCall's side scoring 237 points against Saints in four emphatic victories. Trailing 15-13 at the interval, it seemed the hosts - under the stewardship of interim coaches Alan Dickens and Alan Gaffney - would restore some pride, but they fell apart yet again against the reigning European champions at Franklin's Gardens. Sarries boasted nine different try-scorers as they put their defeat by Leinster last week firmly behind them, beating the 62 points they put past Northampton in January. "I talked earlier in the week about where Saracens have picked us apart in the previous three games and the second half was no different. "We didn't go through phases and they capitalised when we were all over the place. We put them under pressure in the first half and then we capitulated. "I'm certainly hurting and I'm almost lost for words after that second half performance." "It was really pleasing. To win that second half 48-0 and play the rugby we did was good. "We were a little bit disappointed with how we played in the first half but it was really pleasing to see the way we kept them to zero in the second half. "It says a lot about the group in that situation after travelling back from Dublin and having a short turnaround. "We were away from home again and it says a lot that we could be as mentally tough as we were today." Northampton: Tuala; Tuitavake, Horne, Francis, North; Myler, Reinach; Ma'afu, Marshall, Brookes, Ratuniyarawa, Day (capt), Ribbans, Gibson, Harrison. Replacements: Clare, Van Wyk, Painter, Paterson, Nutley, Mitchell, Collins, Foden. Saracens: Williams; Maitland, Lozowski, Barritt, Wyles; Farrell, Spencer; M. Vunipola, Brits, Figallo, Itoje, Kruis, Isiekwe, Cowan, Wray. Replacements: George, Barrington, Longbottom, Day, Burger, Wigglesworth, Taylor, Earle.